oh the feeling of relief when i clicked that send button! you know when you have something looming over you and you just keep putting it off and off and off until one day you decide that’s it, i have to finish this damn thing? i am the world’s best procrastinator. i admit it. i will stand at a podium and declare, yes, my name is catherine and i am the queen of procrastination. yesterday was it. the day to put this project to bed. i have a little sideline, i lead small business workshops. i teach at Beadfx (http://www.beadfx.com/). it’s a very successful canadian beadstore/lampwork studio. a good portion of their retail business is online and my class is listed on their website. they kept fielding calls from all over the continent about my class so they suggested that i put my course materials into a book format and they’d sell it. seemed simple enough and i’d been thinking about it. of course i think about many things i’d like to do – like bicycling around the world and taking cooking classes in thailand. i’ve always thought i’d like to publish a small business book. i do find it frustrating to see so many talented artists failing so badly because of a lack of business knowledge. 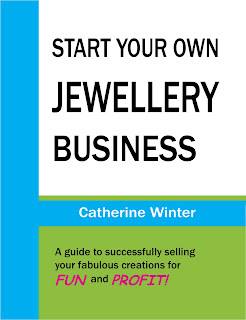 i started small, with a Start Your Own Jewellery Business that is Canadian focused. while i have grandiose plans to write the full version of Start Your Own Craft Business i just had to get something out. i consider this to be the first run. it sold out, quite a while ago actually. so i had grandiose plans to rewrite. well, it’s summer, i have craft shows every weekend, life gets busy and complicated. i did correct a few things, and i got a real cover! and i changed the size of the book. and i just had to get the damn thing done. it has now gone to print!!!!! oh the feeling of relief! i haven’t ordered too many copies because seriously, i really do want to add some things. in the scant year and a half since i wrote this life in the crafty business has changed significantly. there’s blogs, and etsy, and other online venues, and all sorts of other things. as always, i finish one project and start writing the to-do list for the next project for which i am already behind schedule. but for tonight i can breathe a sigh of relief that soon the book will be available again and i can actually check something off my to-do list. YIPPEEEEEE!!!! Yahoo for you!!! You are an awesome teacher. I really enjoyed your class on pricing jewellery. Looking forward to seeing your book on the shelves at beadFX.